July 30, 2009, 9 a.m.
By Ben Cohen @bzcohen July 30, 2009, 9 a.m. The first thing I noticed on AnnArbor.com is, well, the first thing I was supposed to notice. The bare home page doesn’t even try to do the traditional newspaper editor’s job of defining which stories are the most important or pressing. It’s simply a time-sequenced river of news. Think of it as Times Wire, except without the choice to click back to The New York Times’ spiffy home page. This is the home page. Indeed, AnnArbor.com — which launched the day after The Ann Arbor News shuttered — looks more like Digg and Twitter than it does the Detroit Free Press. At least right now, an investigative enterprise story is featured no more prominently than a 200-word blog post. Everything — design, content, even advertising — is different. That unique appeal starts with the unconventional home page, organized by time and not importance. For most stories, all readers see is the timestamp, headline, votes, comments, categorized topics and a photo, if there is one. The main limitation of such a format are obvious: namely, that a big story can be washed away by a torrent of small ones. It’s a concern, but Dearing said that the quick push to launch has kept some layout features from being ready. Soon, the homepage will have the ability to become more flexible — more newspaper-like, in a way — if a story merits the attention. The neighborhood-level reporting is currently focused on a few locations: downtown Ann Arbor, plus Burns Park and Old West . Coverage of other neighborhoods is provided by an Outside.in feed. (“Again, not a perfect solution, but a small start,” Dearing wrote in a blog post announcing the strategy.) He hopes the experiment produces a model for hyperlocal reporting that can be applied to other areas, starting in around six months. But stories from reporters are interspersed with dispatches from local bloggers — who may not know AP style, but who are hopefully fluent in their niches of expertise. Their blog posts currently look the same as, say, a breaking news story, but there will soon be visual differentiation between staff-generated journalism and citizen journalism, Dearing said. Advertisements already have a distinct visual appearance in the news feed. The ads are billed as “deals,” and they are sortable by category on a specific advertising page. Two advertisements pop up in the current nine-story river of news on the front page, with six more under a tab lower on the page. On individual article pages, the deals have prominent displays in sidebars. The advertising is extremely local and, compared to newspapers, extremely cheap, said Dearing, who noted that it’s still too early to translate early enthusiasm from advertisers into quantifiable revenue. POSTED July 30, 2009, 9 a.m.
Cohen, Ben. 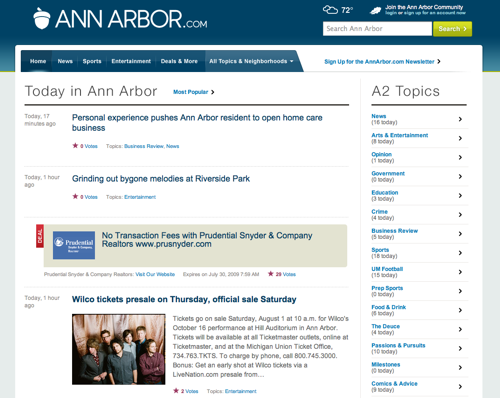 "In Ann Arbor, designing a news site that doesn’t look like a news site." Nieman Journalism Lab. Nieman Foundation for Journalism at Harvard, 30 Jul. 2009. Web. 19 Apr. 2019. Cohen, Ben. "In Ann Arbor, designing a news site that doesn’t look like a news site." Nieman Journalism Lab. Last modified July 30, 2009. Accessed April 19, 2019. https://www.niemanlab.org/2009/07/in-ann-arbor-designing-a-news-site-that-doesnt-look-like-a-news-site/.